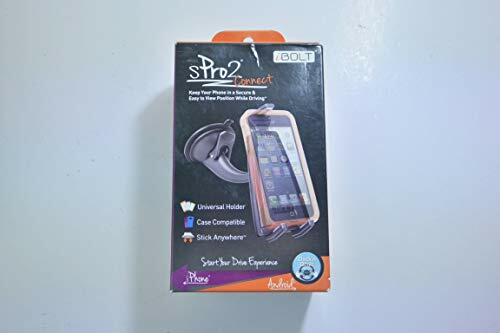 iBOLT sPro 2 Connect Kit for iPhone, Samsung, HTC, Motorola, Nokia, LG, and Sony. Stay connected with your world using the sPro 2 Connect Kit. The open design keeps the volume and power buttons accessible along with the charging and auxiliary ports. Protective cases and extended batteries can be used with the sPro 2. The NFC Tag launches iBOLT Dock Mode. Dock Mode turns on/off the iBOLT Dock'n Drive app automatically. This feature works with any NFC enabled Android phone. Android phones without NFC can still utilize the app by launching manually. This is done by tapping the App Icon. Fits phone/case combinations from 4.5 In (115mm) to 607 In (170mm) in height, and unlimited width and depth. Keep your phone charged and in a secure and easy to view position while driving. Included NFC Tag compatible with any NFC enabled Android phone. COMPATIBILITY: Designed to fit Android and iPhone. CASES: Holds all Cases, including large cases like Otterbox Defender, or XL batteries like ZeroLemon. MOUNTING: Strong and vibration free ROK II Mount included. Attach on windshield OR dashboard. Camera view "open" on all Galaxy's. DOCK'N DRIVE: NFC Tag launches Dock'n Drive app turning your phone into a virtual driving assistant.